I love my new jewelry. Not that I can wear it out of the house. Not without looking like some sort of perverted pathetic dork, anyway. But I guess I could wear it around inside the house. No. That wouldn’t work either. I’m sure my wife would be quick to point out that I look some sort of perverted pathetic dork there too. It’s about three inches in diameter and hangs on a blue ribbon. I got this medal in the one area where I’m truly talented. No. Not a hot dog eating contest. No. Not for binge drinking. No. Not for swearing in a public place. OK. I guess I do have more than one talent. Think letters, and words, and sentences! Oh my! Yep. Now you’ve got it! It’s a writing award! 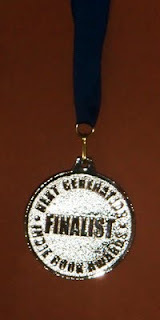 Beyond Fingersticks, my Continuous Glucose Monitoring “bible” just won a finalist medal in the Health/Wellness category of the 2011 Next Generation Indie Book Awards! And if you’re not supposed to wear it, then why does it come on a ribbon? Hmmmmm….. I’ll bet Gary Hall, Jr. wears his medals around in the house. After his wife goes to bed. Wear it in good health!!! Congrats! You wear that darn thing proudly! Congrats, Wil! So awesome and well-deserved, indeed. I need to remember to bring a copy of my book and have you sign it. To make it even more special... Oh, and you're right: I'd wear my medals around late night too. Might even sleep with them on... You just never know.